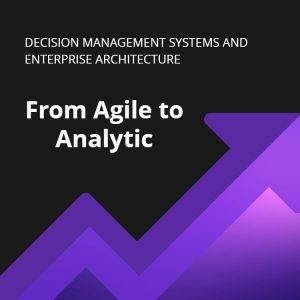 Decision Management Systems combine business rules and advanced analytics technologies to deliver an agile, adaptive and analytic enterprise architecture. Enterprise Architects are chartered with fitting business rules and analytic technologies like data mining and predictive analytics into their enterprise architecture. A service-oriented platform and architecture, supported by integration and data management technology does not have obvious “holes” for these technologies. Decisions are both the shared framework and the technical mechanism to easily implement these technologies. This paper introduces the concepts of Decision Management Systems and shows how such systems can be integrated into your Enterprise Architecture. The importance of decision modeling and the role of business rules and a business rules management system (BRMS) in delivering agility for these systems is outlined. The potential for data mining and predictive analytics to drive increased accuracy and profitability by making these systems analytic as well the role of experimentation in making them adaptive is discussed. Agile, analytic and adaptive Decision Management Systems are a critical component in a modern enterprise and they require more than just business rules and business agility.